Tuan Chau Island is the island that owns the land, not just chalk hill. Outstanding natural beauty makes President Ho Chi Minh make this island as a resort in 1959. The island has an area of ​​400 hectares with a population of 1500 people. Reportedly, the island area to be widened up to 675 acres. 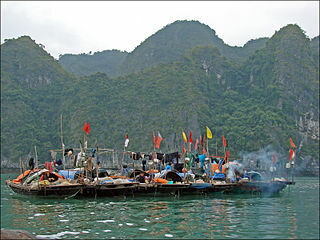 Unlike the other islands in Halong Bay, the island also has access to the mainland. Tuan Chau has become one of the destinations for domestic travelers to international. On this island, there are various facilities like a 5 star resort with 200 rooms, 4 km long artificial beach, a traditional Vietnamese dining area, performing dolphins and seals, circus, crocodile show, musical fountain show and the advanced laser light, water rides with a wide range of activities, and so on. In this island there is a beach named Tuan Chau beach. It is located about 8 km from Halong City. This is Tuan Chau beach with artificial sand beach along the 3 km. Vang Island ecotourism complex which is located in Bai Tu Long Bay, about 13 kilometers from Cam Pha. The beach on the island is small, but still very clean. On this island will be built tourism facilities and rest houses. When you take a tour of Halong Bay, tourists will most likely get a chance to stop at the island. Ti Top island located about 8 kilometers southeast of Bai Chay. The beach on the island is formed like a crescent moon, as embraced Ti Top Island. The view from this place is beautiful and very clear. White sandy beaches suitable for swimming and a playground. On the beach there is a bar that provides snacks, beverages, and a swimsuit. In the holiday season, this beach is full of tourists who follow the tour. Ti Top Island gets its name from a Soviet astronaut, Ghermann Ti Top. The astronauts visited the island along the Ho Chi Minh City in 1962. As a reward, Ho Chi Minh City to give the name of the island as the name of the astronaut. At 1991, Ghermann Ti Top returned to visit the island to remember the past. Ba Mun Island became part of the community Minh Chau in Dong Van District. The island is parallel to Quan Lan Island, separated by the Doi Gate. The island measuring 1800 hectares and is located 15 kilometers from the mainland. The highest peak on the island is a mountain with a height of 397 meters Quit. This island is one area of ​​Halong Bay which has a virgin forest. There are so many types of plants that grow on the island. some trees have a very large trunk. The island is also the habitat of various species of rare animals such as monkeys, deer, and antelope chamois. To preserve nature Ba Mun Island, the Vietnamese Government has set up the island became a national park in 1997.